Chromatin immunoprecipitation followed by genome tiling array hybridization (ChIP-chip) is a powerful approach to map transcription factor binding sites (TFBSs). Similar to other high-throughput genomic technologies, ChIP-chip often produces noisy data. Distinguishing signals from noise in these data is challenging. ChIP-chip data in public databases are rapidly growing. 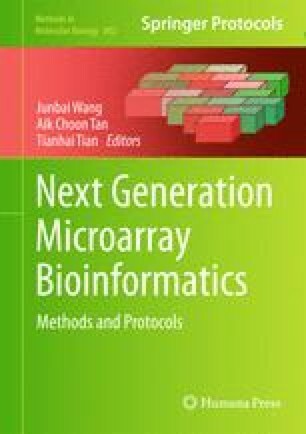 It is becoming more and more common that scientists can find multiple data sets for the same transcription factor in different biological contexts or data for different transcription factors in the same biological context. When these related experiments are analyzed together, binding site detection can be improved by borrowing information across data sets. This chapter introduces a computational tool JAMIE for Jointly Analyzing Multiple ChIP-chip Experiments. JAMIE is based on a hierarchical mixture model, and it is implemented as an R package. Simulation and real data studies have shown that it can significantly increase sensitivity and specificity of TFBS detection compared to existing algorithms. The purpose of this chapter is to describe how the JAMIE package can be used to perform the integrative data analysis. The authors thank Drs. Eunice Lee, Matthew Scott, and Wing H. Wong for providing the Gli data, Dr. Rafael Irizarry for providing financial support, and Dr. Thomas A. Louis for insightful discussions. This work is partly supported by National Institute of Health R01GM083084 and T32GM074906.